In 2011 I attended what turned out to be the final Thursday at the Square concert at Lafayette Square. Grace Potter & the Nocturnals headlined but I was there early enough to see the band right before them, Fitz and the Tantrums. The two bands combined to produce a show that was the best free show I have ever seen. I was struck by the energy that Fitz and company brought as well as their sound which blended classic soul and Motown in a modern way. That performance seemed to earn them a lot of fans as they returned to headline at Canalside in 2012. This past Thursday brought a huge turnout for the band. It certainly helped that the weather was perfect but Buffalo needed its Fitz fix and got it. The last time they were in town their second album was not yet released though they did perform the first single “Out of My League”. This time, the 2013 release More Than Just a Dream made up most of the setlist but there were still a few tunes from their 2010 debut Pickin’ Up the Pieces (the title track was unfortunately not played). Their cover of the Eurythmics classic “Sweet Dreams” continues to be a part of the show and is always a highlight. As good as their albums are, this is a band that needs to be seen live. The dynamic between vocalists Michael Fitzpatrick and Noelle Scaggs is fun to watch. Both are excellent singers and their voices blend together well. Scaggs is a force of nature, dancing and playing tambourine throughout. Audience participation is not just encouraged at a FATT show, it’s pretty much required. Even if you’re usually the “sit back and enjoy the music” type, it’s impossible not to get caught up in the moment. Credit to the rest of the band (James King-sax and keyboards, Joseph Karnes- bass, Jeremy Ruzumna-keyboards and John Wicks-drums). They showed their talents all night especially on “L.O.V.” which built to a frenzied ending. Towards the end of the show, Fitzpatrick expressed sincere thanks to Buffalo fans for showing their support from the beginning and making their dreams come true. The encore of “Money Grabber” and “The Walker” had the already wild crowd taking it to another level. 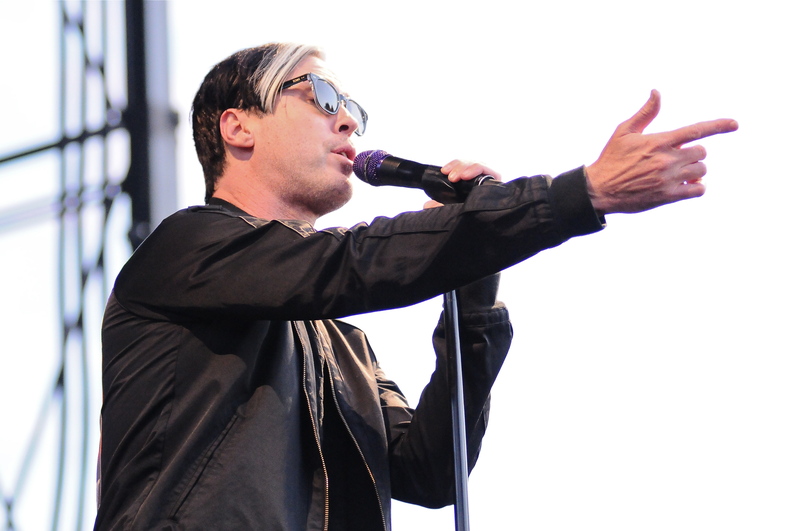 Fitz and the Tantrums may be from Los Angeles but they clearly love Buffalo, and vice versa. I think we can expect more memorable shows from them here in the future. Also performing was Max Frost from Austin, Texas. He played a well-received set that combined rock with hip-hop and R&B influences. A cover of Rick James’ “Give It To Me Baby” was a nice touch for his first Buffalo show and was well done. Buffalo band The Albrights took the stage first. They called it “the highlight of their summer” to be able to play Canalside. Beautiful weather and an excellent night of music from beginning to end. Buffalove, indeed.